Urban Bike Project is committed to following four core strategies, which combined help our programs to be as effective and meaningful as possible. Community driven: Urban Bike Project strives to meet the needs of the community, as defined by the community. We seek community partnerships whenever possible, and are always interested in receiving feedback from our visitors. Education: Educational programs give youth opportunities to build confidence and develop problem solving skills, while empowering adults to make safer choices about bicycling as a means of transportation and recreation. We raise awareness about cycling in motorists, pedestrians and the community at-large. Education is at the core of all of our programs and community involvement. Open access: Our open shop hours are available to anyone who is interested in purchasing a low cost bicycle, receiving help repairing a bicycle, or learning more about bicycling in the area. We don’t care where you live or where you work, if you would like to bicycle for transportation or recreation we are ready and willing to help. 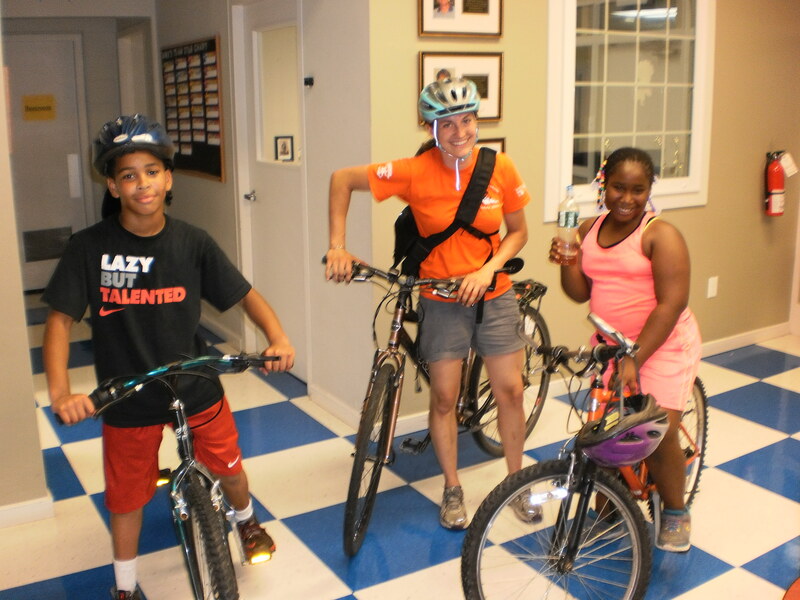 Laura with two graduates at the Fraim Boys & Girls Club Build-a-Bike program sponsored by the Mike Clark Foundation.